Delta Zeta donors gave graciously to provide $233,500 in scholarship dollars awarded for the upcoming academic year. 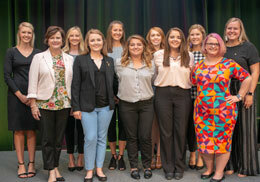 The Delta Zeta Foundation awarded 31 graduate scholarships and 41 undergraduate scholarships, with the winners representing members throughout the US and Canada. These sisters exemplify academic excellence, outstanding service and dedicated involvement on their campuses and in their communities. Nicole Petersen, Epsilon Kappa – University of Wisconsin/Whitewater, is looking forward to being a high school history and English teacher, after being inspired by her high school cross country coach. “I always wanted to be like her – she was a mother-figure and friend, and provided guidance and discipline,” Nicole said. Working four jobs throughout the calendar year and paying for her education herself, winning the Sandra Sebrell Bailey Scholarship makes a significant impact on Nicole and her education. Nicole attended the 2017 Norma Minch Andrisek Leadership Conference, the 2018 Presidents Academy and National Convention as Chapter President. She looks forward to encouraging others to pay it forward now that she is a scholarship winner. “We as a sorority and chapter stand for ‘Empower the Woman.’ We need to branch out to other people and give them the resources to be better versions of themselves – it creates a chain of everyone empowering everyone, helping others succeed,” she said. Graduate scholarship recipient, Shanley Treleaven, Alpha Gamma – University of Alabama, shared that she chose her career path because of Delta Zeta. “Delta Zeta inspired me to pursue a career as a speech-language pathologist. Hearing about our philanthropy helped me make this decision in my sophomore year, when I only knew that I loved language and words, but had no idea how to apply this to future career plans.” Shanley is obtaining a Ph.D. in Communication Sciences and Disorders at Louisiana State University. Shanley credits Delta Zeta in feeling empowered as a woman in the STEM (science, technology, engineering and mathematics) field – a traditionally male-dominated field where she aspires to make an impact. She went on to say that Delta Zeta is the pinnacle of women supporting other women. As a Gail Patrick “Women of Distinction” Scholarship winner, this scholarship serves as a life preserver thrown during a storm to a Ph.D. student living off a small stipend and paying out of pocket for university expenses. Your gift has made an impact on not only Nicole and Shanley’s future, but countless other Delta Zetas. Click here to view the full list of 2018-2019 scholarship recipients.